I was recently interviewed by Voyagela. In the article I speak a bit about my musical background, what I'm up to now and challenges that I've faced along the way. In this short article on Learnivore I’m quoted about how musical ideas come to me. Check out this article on Learnivore for a recent quote about some of my musical inspirations. New Class - "The Basics of Notation"
I just received a nice feature on Skillshare’s blog here. You can check out the class mentioned in the blog post, Songwriting Basics, here. A few months ago I started teaching private online music lessons on a platform called Care2Rock. They are an awesome organization that also provides free music lessons for children in foster care through a collaboration with National CASA Association. As part of my teaching on the platform I have volunteered to give free music lessons to a 10 year old foster child in Chicago. We’ve only had a few lessons and he is already playing a Beethoven melody on piano. It has been one of the most rewarding things I’ve ever done in music. Anyways, Care2Rock has interviewed me about my musical background, including collaborating with Wu-Tang Clan members Black Knights and also what I’ve been up to lately. You can check out the interview here. New Class on Scales & Modes! Brand New Class on Composing Melodies! 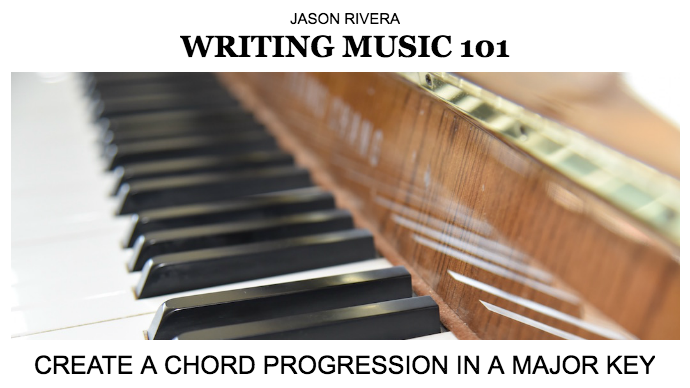 Check out my new short online class "Writing Music 101: Create a Chord Progression in a Major Key" at this link! Today I had the great pleasure of conducting a read through of a new work that I recently wrote for 41 piece orchestra. Thank you so much Symphony 47 and AFM Local 47 for having me. So grateful! Laying down some guitar on a new track! There I go waving my hands around again.